Newport is a town in and the county seat of Sullivan County, New Hampshire, United States. It is 43 miles (69 km) west-northwest of Concord. The population was 6,507 at the 2010 census. A covered bridge is in the northwest. The area is noted for maple sugar and apple orchards. Prior to county division in 1827, Newport was in Cheshire County. The central part of town, where 4,769 people resided at the 2010 census, is defined as the Newport census-designated place (CDP) and is located next to the Sugar River at the junction of New Hampshire routes 10 and 11. The town also includes the villages of Kelleyville, Guild, and North Newport. Granted in 1753 by Colonial Governor Benning Wentworth, the town was named "Grenville" after George Grenville, Prime Minister of the United Kingdom and brother-in-law of William Pitt. But ongoing hostilities during the French and Indian War, as close as the Fort at Number 4 at Charlestown, delayed settlement. Nevertheless, in 1761 the town was incorporated as "Newport", for Henry Newport, a distinguished English soldier and statesman. It was first settled in 1763 by pioneers from North Killingworth, Connecticut. Absalom Kelsey was one of the earliest settlers. The first blow in clearing the forests in the new town was struck by Absalom Kelsey on the D.F. Pike farm at the foot of Claremont Hill. At that time, the Connecticut River was the only route for travel, until a road was cut through the wilderness to Charlestown in 1767. The following year, the first gristmill was established. But dissatisfied with treatment by the state government far beyond the mountains, Newport in 1781 joined 33 other towns along the Connecticut River and seceded from New Hampshire to join Vermont. George Washington, however, dissolved their union with Vermont in 1782, and the towns rejoined New Hampshire. But the river was recognized as central to industrial development, and in 1820, mill owners from Claremont, Sunapee and Newport united to create the Sunapee Dam Corporation, which built a dam to regulate the Sugar River's flow, running mill machinery even during drought. This plan worked, and over 120 water wheels would turn along the stream's course. By 1859, when the population was 2,020, Newport had three woolen mills and two tanneries. It also had the Sibley Scythe Company, established in 1842, which manufactured the scythes that cleared jungle during construction of the Panama Canal. It closed in 1929. The venerable mill town has significant architectural landmarks, including the 1823 South Congregational Church designed by Elias Carter, the Newport Opera House built in 1886, and the Richards Free Library, built as the home of Colonel Seth Mason Richards in 1898. During the summer and fall of 1765, six young men came to Newport from Killingworth, Connecticut, cleared six acres of land each, and, after getting in a crop of rye, returned home and spent the winter. The following year, in June 1766, these men having an addition of two to their number, making eight in all, five having families, came and made the first permanent settlement. No record or tradition is found showing the precise day of their arrival. All accounts agree that they arrived in town Saturday night; that they were detained by a bad place in the road on Pike Hill, where they camped for the night; and the following day, after accomplishing the remainder of their journey, they spent in religious worship under the shadow of a pine tree which stood just south of the A. Pease residence. The following were among the earliest settlers, the first five having families. According to the United States Census Bureau, the town has a total area of 43.7 square miles (113 km2), of which 43.6 sq mi (113 km2) is land and 0.1 sq mi (0.26 km2) is water, comprising 0.18% of the town. 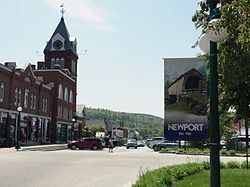 Besides the central village of Newport, other settlements within the town include North Newport, Kelleyville (in the western part of the town), Guild (in the eastern part of the town), and Wendell, on the town's eastern border with Sunapee. Newport is drained by the Sugar River and its South Branch, with the town center at their confluence. The North Branch joins the Sugar River north of Newport village and east of North Newport. The highest point in town is along its southern border, where an unnamed ridge has an elevation of approximately 1,920 feet (590 m) above sea level. The town is served by state routes 10, 11 and 103. Newport is home to Parlin Field Airport. As of the census of 2010, there were 6,507 people, 2,629 households, and 1,706 families residing in the town. There were 2,938 housing units, of which 309, or 10.5%, were vacant. The racial makeup of the town was 97.2% white, 0.3% African American, 0.2% Native American, 0.4% Asian, 0.0% Native Hawaiian or Pacific Islander, 0.3% some other race, and 1.6% from two or more races. 1.1% of the population were Hispanic or Latino of any race. Of the 2,629 households, 31.2% had children under the age of 18 living with them, 46.1% were headed by married couples living together, 12.6% had a female householder with no husband present, and 35.1% were non-families. 27.1% of all households were made up of individuals, and 12.9% were someone living alone who was 65 years of age or older. The average household size was 2.43, and the average family size was 2.89. In the town, 22.8% of the population were under the age of 18, 8.4% were from 18 to 24, 23.1% from 25 to 44, 29.7% from 45 to 64, and 16.0% were 65 years of age or older. The median age was 41.7 years. For every 100 females, there were 94.2 males. For every 100 females age 18 and over, there were 88.9 males. For the period 2011-2015, the estimated median annual income for a household was $49,663, and the median income for a family was $60,317. The per capita income for the town was $25,969. 9.6% of the population and 4.6% of families were below the poverty line. 6.9% of the population under the age of 18 and 8.7% of those 65 or older were living in poverty. ^ "Welcome to the Official Town of Newport, NH Website!". Town of Newport. Retrieved September 12, 2016. ^ Kelsey Genealogy Vol II. Clinton, CT: Kelsey Kindred of America. 1929. p. 58. ^ a b Coolidge, Austin J.; Mansfield, John B. (1859). A History and Description of New England. Boston, Massachusetts. pp. 602–603. ^ Wheeler, Edmund (1879). The History of Newport, New Hampshire, from 1766 to 1878, with a Genealogical Register. Concord, NH: Republican Press Association. ISBN 978-1230249087. ^ a b c "Profile of General Population and Housing Characteristics: 2010 Census Summary File 1 (DP-1): Newport town, Sullivan County, New Hampshire". American Factfinder. U.S. Census Bureau. Retrieved November 13, 2017. ^ "Selected Economic Characteristics: 2011-2015 American Community Survey 5-Year Estimates (DP03): Newport town, Sullivan County, New Hampshire". American Factfinder. U.S. Census Bureau. Retrieved November 13, 2017. Wikisource has the text of a 1905 New International Encyclopedia article about Newport, New Hampshire.